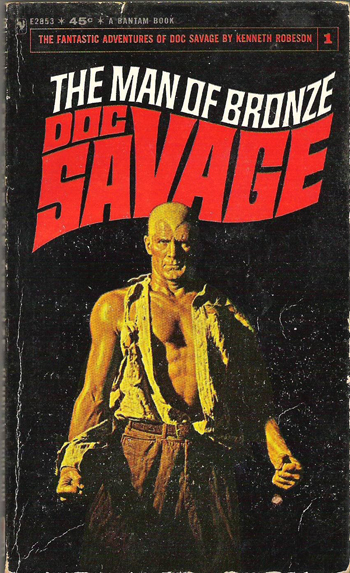 I don’t remember when I ran across the first Doc Savage book but it was sometime after I passed through the Tom Swift series and graduated to Heinlein. Pretty sure the first one was a paperback. The small town in West Virginia where I spent my junior high and high school years didn’t have a bookstore or even a newsstand as I recall. The local drug store was the only purveyor of paper back books and magazines. We did have a musty ancient library where I was lucky to find a fair selection of science fiction hardcover books. I think I must have tripped over Doc Savage in later years in the form of a gaudy Bantam paperback. My early literary education came from the Hugo Gernsback style of writing, with precursors of Verne and Wells so the image of the hulking hero had its allure. These books were awesome for the gosh-darn-eye-widening amazement. Doc was the first super hero. Re-reading “Man of Bronze” brought back that sense of wonder in the twelve year old me. No feat was beyond the physical capabilities of Doc Savage or the wealth of technical knowledge required to escape any peril. The writing is hyperbolic and prone to excess especially in the descriptions of Doc Savage’s physical feats. ‘Amazing’ is likely the most over used word in the book. Doc and his crew of wise cracking buddies head to the south American country of Hiladago as a result of a mysterious message left by Doc’s father who was killed by assassins who also made an attempt on Doc’s life. They encounter a hidden Mayan culture, red fingered assassins led by an evil character named Morning Breeze. Somehow the name doesn’t convey the vicious deadly evil of this nefarious dude but, hey, it was 1933. Oh yeah, there is a hidden treasure of gold beyond compare along with a deadly disease, called the Red Death, used as a biological weapon. Morning Breeze’s boss masquerades as the feathered serpent of Mayan lore, to sway the village against Doc. An attempt at romance is tossed into the mix with the introduction of Princess Monja, a woman, “…well bread enough not to show her feelings openly.” She is the daughter of the Mayan king and has the hots for Doc. If you want a bit of retro adventure, a la 1930’s with massively muscled characters, then, these early Doc Savage novels are a blast.